oly Messiah, indeed! There aren’t many articles in the Entertainment category on my blog, but I’m a fan of classical music and found this unique presentation of “Messiah” by George Frederic Handel hiding in the YouTube database. It’s a stunning revisitation of a masterpiece by one of the world’s greatest composers. If I may politely respond. As one who believes every word, given the source, I still applaud the message and the central theme and characters. The music is outstanding, and while I don’t see them, the orchestra is truly outstanding in its voice. If I were to see this as a Sacred Oratorio instead of a writer’s interpretation I could and likely would join you — as I did at first listening and watching. Once I realized the literary license employed, the central characters and theme and the outstanding performance, I cheered the members of the choir, soloists and the fine stagecraft — and the outstanding orchestra. Please accept my comment with no negatives intended, and I can agree (and do agree) with you if this were meant as the original work. The only part that “bothered” me was the failure of people to stand for the Chorus, *Hallelujah,” (Chorus, at #41 in the work), as the custom! I have sung this as part of a choir and as a member of the choir — as choral literature it is outstanding and it is a favourite. May I politely ask: were/are you viewing/hearing this work as the original scriptural work or as an interpretation of a funeral and the feelings thereof? If the second, I can see from whence you come! Know that many agree with you – but would your feelings be different if you saw this as a literary work of art instead of a “Sacred Oratorio”? I dare say while the music is scriptural to the letter, the message is solely and totally different, and refreshing. I do speak from a USA point of view, so maybe I am one who “does not understand” this. Thank you for allowing me a fairly long explanation. I mean to support you, and at the same time cheer the work. f ALL of Handel’s Oratorios, I think the Messiah is the MOST DIFFICULT to dramatize. Successful or not, this is a valiant attempt, and should not be thus discouraged. ime Magazine couldn’t have chosen better, IMHO, for person of the year for 2013. The pontiffs that have ascended the clergy to fulfill the tradition of being humanity’s direct channel to #God seem to have all been good men in my lifetime. But Francis seems to stand out as one who can really bring God into the lives of the masses in a meaningful way and for a goodly number doing so with an air of humility and service that few of his fellow clergy (whatever their faith) seem able to match. I was particularly impressed this year with his affinity for personal poverty and welcoming homosexuals into the Church he represents in a public way (and seemingly absent the theological distractions that have at least appeared to bar his predecessors from doing in like kind – and therein bringing into question their true discipleship of #Christ, in my view). Well done, #Time! And long-live #Pope #Francis! April 1: 3-D illustrator Ray Downing describes the process used to extract a realistic image from the Shroud of Turin. hat did Jesus Christ actually look like? Of course, if there ever were any portraits or sculptures made of Christianity’s founder, none have survived to the present day. Over the centuries, the subject has been the source of great speculation and even was one of the principle issues contributing to splits within the Church; most notably, the great division between the Roman Catholic and Greek Orthodox traditions. Well, a graphic artist has used the Shroud of Turin to establish a 3-dimensional rendering of Christ’s likeness. The technology is similar to Microsoft’s Photosynth technology, recently developed by Microsoft Research. And this video from MSNBC exhibits an interview with the graphics expert responsible for the work with the relic reputed to have been the robe Christ was buried in following his execution by Roman authorities between 20 and 30 A.D.
Issues like this breed confused dialogue and quasi-religious tangents faster than rational folk can respond. Before very long, one gets cynical and dismisses the rest of the world as a thinly-veiled looney-bin, generally speaking. But if instead one pauses to examine the reader comments left in the wake of a news story of this kind and contemplate what, other than simple craziness, might lay behind seemingly arbitrary assertions of morality – a pattern emerges. The notion being advocated, yet not otherwise stated, is simply that “Behaviour contrary to the ‘preferred lifestyle’ (i.e. outside of traditional heterosexual monogamy) is wrong, because it is also contrary to the written word of God. Questioning the accepted interpretation of the written word of God necessarily indicates a lack of faith, which is also wrong. Therefore in order to behave rightly, it’s best to not think critically lest it lead one to question the accepted understanding of God’s word.” One might add to this that lip-service may be paid to openness to such questioning – provided that the discussion results in the unequivocal affirmation of the accepted understandings of God’s intentions. Granted, not all of this resistance to what gets labelled “secularism” is the result of rooms full of mostly clergymen enforcing doctrine. In many cases, the church’s own congregation is to blame. And there are all kinds of sociological reasons one could forward to characterize individual scenarios. But again, in general, churches are attended by people looking for enlightenment from a higher power – a power that has been type-cast and is universally accepted as being opposed to gay marriage and polygamy. So if the clergy aren’t entirely in control of how God’s word is interpreted, the congregation is already stacked with generations of followers, raised from childhood with a healthy list of preconceptions (too often disguised as mere tradition) that achieves the very same thing. When mulling over what it must be like for people who think at this level, I can’t escape the notion they’ve got to harbour hatred or at least some kind of disdain for those they consider “an abomination”. To use that kind of adjective – which intones ideas of inherent wrongness; a malignancy that needs to be eradicated to set the world right again – there’s certainly an idea here that a kind of mercilessness and disregard for the needs or desires of the other party (or “the abomination”). And, admittedly it’s been a while since I found myself paging through the New Testament, but from what I remember this doesn’t reflect Christ’s teachings. The inevitable comeback concerns whether being gay or even polygamous is itself sinful or, in other words wrong. We don’t hear a lot of those opposed to gay marriage or polygamy using the word “sin” or “wrong” when they intone their opposition – very likely because it’s understood that the vast majority of the population simply doesn’t agree there is a moral issue permitting either. Occasionally, we’ll hear a televised zealot cite scripture where it indicates ‘man shall not lie with man’ or whatever (I can’t cite a specific example at the moment), but outside of the 10 Commandments, the Bible wasn’t ever intended to catalogue behaviour into ‘acceptable’ and ‘unacceptable’ indices. The overwhelming theme of the Bible is one of studying the all-powerful, all-knowing and all-loving God. Even if there were a few passages that could only be singularly interpreted as stating ‘gay marriage is wrong’ or ‘polygamy is wrong’ (and I’m quite sure there aren’t), there is much more evidence that He would rather we looked for ways to eliminate specific harm to our fellow human beings; to make life as pleasant as we can for each other. To the Christianettes, this will all seem irrelevant, of course. One can’t pick and choose which of God’s directives to follow, they’ll say; or some other argument that willfully misses the point. But while still believing polygamy is wrong for the same reason being gay is wrong – because God says so – will not be cited aloud during the general public debate. Instead, this same group will conjure up all kinds of other reasons why polygamy is harmful; perhaps it spreads disease, or it creates health issues. Perhaps organized crime is involved somehow – something will come up. Fortunately, we live in Canada where people seem inclined to be more pragmatic in evaluating issues of this sort. So I suspect the polygamy debate will run much the same as gay marriage – with a well-reasoned outcome. But the religious wing-nut is an increasingly thriving species hereabouts and this resistance not only to reason, but to remembering God’s disposition toward those traditionally rejected by society demands vigilance by all who crave tolerance and freedom. Finally! An academic from view opposite of that held by Richard Dawkins is penetrating whatever clique it is that governs the talk show circuit and best sellers lists which ultimately seem pivotal in the process of determining what book(s) the average Joe hears about. 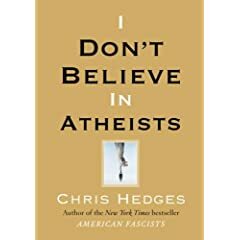 Chris Hedges, author of a new book called "I Don’t Believe in Atheists", goes after Dawkins, Christopher Hitchins, Sam Harris et al on their "chauvinism" and "arrogance" about religion which makes their reasoning on the subject indistinguishable from that used to justify religious fundamentalism – the very ‘evil’ they mean to expose. Now while I welcome Hedges work, I haven’t yet read his just-published book on this subject. I’ve only seen a couple of video segments in a talk-show/interview setting. Eventually, I’ll likely have that opportunity – but I worry that his work may also be lacking the subjective depth this debate really deserves. Last year, I write a critique of Dawkins views (citing references in his published works) wherein I was critical of the immaturity of many of the arguments. So far, I haven’t heard anything to justify taking this view of Hedges work although unlike Hedges, I didn’t explicitly argue that Atheism in a radical form, in part, because the whole idea of taking Dawkins reasoning and applying it toward atheism would, to me, only be something of a validation of his reasoning. At this point, I can only hope Hedges won’t take the argument in this direction. Arguing that having a view characterized as "fundamentalist" is always wrong is just as dogmatic as any other ideologically-based argument. My preference, and I think the preference of the true student of philosophy, needs to be arguing ideas on their own merit. Characterizations are only a means to summarize, after all. war with Iran is inevitable and will likely start Armageddon. The implied conclusion would also be that Armageddon will involve two groups: Islam and Christianity, with the latter being the inevitiably victorious party. I admit, I’m a "believer". A Christian – one who follows Christ’s teachings and tries (mostly unsuccessfully) to apply them in my everyday life. But it pains me that such lunacy forms the core idelogy of a broadcast empire that spans the globe, according to members of this same group, thus reaching hundreds of millions of people. I see it as an instrument – not of God’s word – but of spawning conflict and doing those very things every prophet of God has railed against since the dawn of mankind. Lost amidst the pretentious chastisement of homosexuality and mouthing of sanctimonious claims of how God still loves you even if you’re gay was the obvious fact that it’s exactly these atittudes that prevent Christianity from making any headway in the population. In fact, it might just take Armageddon at this point to convince anyone God is real, thanks to the hopelessly self-indulgent nature of Christianity’s evangelical arm. What these people need is a good theological crisis to bring them around. There’s a preconcieved notion of what God is in this group, and no other view is regarded with anything but disdain. If you don’t believe what is narrowly interpreted as "Biblical truth", then you’re simply not qualified to be accepted into Heaven – accpted by God, or his Church. It wouldn’t be such a big deal, except – again – it’s this group that’s broadcasting this nonsense all over the world and its doing Christianity a big disservice, as time will ultimately show. It’s such crap, I gotta say I’m feeling a little sympathetic to those outside the U.S. who see this stuff and want to wipe this uniformly pro-Israel, star-spangled God from the face of the Earth. But hopefully, it doesn’t come to that. A big step forward would be those professing a "calling" to do His work to take a step back and rethink just how sure they are they know what that word is first. And maybe think too on what the consequences might be of getting it wrong. I’m so sick of listening to one contemporary atheist after the other (like Richard Dawkins, author of The God Delusion) accuse Christians, somewhat arrogantly, of being "dangerous" or even "unethical", citing arguments like the existence of Muslim extremists who think not believing in God ought to be punishable by death, or because the creationist movement in the U.S. believes the Earth is 6,000 years old and want the right to teach it to children, or that the U.S. President is banning potentially life-saving stem cell research because of his own religious convictions – all supposed evidence that religion is a cancer of the human soul that brings only harm. As if any of these products of human fallibility somehow were the fault of religion while in fact most Muslims don’t believe atheism should be persecuted, while creationists are not representative of the faithful in any way, and while the current U.S. President is less an agent of God than an agent of embarrassment for the people he governs. So why are all the world’s problems suddenly the fault of the faithful? Well, I think it’s in vogue these days to be an atheist (right down to the rapper on tonight’s CBC news special on the growth of atheism in Canada). It’s in vogue because people are very aware of the negative spin President Bush puts on everything he touches and, since he’s a believer, well that probably is good evidence religion is, indeed, crazy. I especially love the argument that believing in God amounts to belief in childhood abstractions like the tooth fairy and Santa Claus. But all these arguments, while in some cases rhetorically seductive, are not rational arguments against God, in that they are analogies rather than addressing the philosophical point of whether or not belief in God (or perhaps the tooth fairy and Santa Claus) is justifiable. This is the conversation you won’t see on any TV show nor in any of the best-selling books out there – because it’s going a little deeper than some of the so-called leading philosophers on the subject ever go. Indeed, these days, it’s hard to find a best-selling book defending God’s existence; because in a world seemingly filled with terrorists killing in God’s name, people are searching for a new religion that could perhaps overwhelm the world the way Christianity conquered ancient Rome. But none of it is real philosophy. Dawkins’ book and others like it are only the pabulum the masses are starving for – spoon-fed beliefs to replace the old-world values that actually have been challenged by far more worthy anti-theologians in the past (like Marx and Nietzsche), but who published their more in-depth works as part of a real academic debate. And published at a time when it wasn’t in-vogue. Let’s look critically then at these popular arguments to understand why they’re not "worthy" to be included in this debate. Again, my favourite, is the equation between religion and childhood belief systems like Santa Claus – so we’ll start here. On the surface, there are certainly some similarities between the big red-suited man and the big man. Both are invisible – and this is perhaps the most persuasive part of the analogy, because often contemporary atheists love to cling to the empirical evidence argument. Both are purveyors of "good things". Both figures exist in a framework that includes a story about their origins, and their existence. Both exist in a cultural context. Both are referred to as ‘he’ in their respective frameworks. And both oppose and ultimately punish bad behaviour. Arguably, both are artifacts of control. Wow, turns out there are, indeed, a lot of similarities here. Am I wrong to think there’s a difference? Well, what about the differences? Contemporary atheism preaches, pretty much universally, there aren’t any. And yet, nobody prays to Santa Claus (notwithstanding the confusing version of this figure, venerated as St. Nicholas throughout Christianity, which casts him as a patron saint of children – who I consider a different entity). In fact, this may be "the biggie" that kills the whole argument from atheism for me – and it’s something that if you are truly an atheist, I don’t think you can understand. It’s one of those things in life where if you haven’t done it before (I mean, believe in God) you probably won’t get it: nobody who believes in Santa Claus thinks that the’s actually listening to them and taking an interest in their life’s experience or the good of their soul. The most obvious argument to this is "so what;" that’s just not part of the Santa Claus mythology. But that’s missing the point here – Santa Claus is not involved in any "greater picture" nor complex enough conceptually to give a damn about any particular set of values other than "being a good boy" or "good girl". There’s no statement about what that means or what difference it makes. Some other differences are, of course, that Santa is not all-powerful, nor necessarily all-knowing, and definitely not all-loving. His apparent enslavement of a community of elves brings forth a number of potentially uncomfortable questions for the pro-Santa Claus movement. And I suspect the animal rights folks might want have a word about his ongoing treatment of that herd of reindeer he annually forces to drag tonnes of toys the entire length and breadth of the world in the span of but a single night. But God, to be a God and to exist, necessarily needs to be all-knowing, all-loving and all-powerful. (That is, if we’re speaking of religion in the context of monotheism, which for this dialogue is all I’m going to address.) Santa doesn’t know what will happen in the future, God does – and this raises whole arguments around concepts of free will and determinism, subject matter lacking from many of the more popular, recent works. Santa is responsible for creating toys, God is responsible for all creation. There’s even difference in one of the earlier cited similarities; although both punish bad behaviour, there’s an important distinction in how bad behaviour is punished. Santa penalizes by rewarding bad behaviour less well (i.e. fewer toys), whereas God punishes bad behaviour by denying one access to heaven. At this point, I could contrast the tooth fairy and reach a similar list of differences, but to summarize, the main differences between these two conceptually lie in the complexity of the belief systems and both in the moral truths one can discover through the study of one versus another. To deny this point in the wake of the evidence discussed above would be roughly tantamount to trying to argue the world is 6,000 years old. So can we please retire the "Santa Claus" argument? It is contemporary atheism that has struck itself a chord playing on the hopes and fears of our time. Here we are at the start of the 21st century amidst the turmoil of apparent religiously-motivated violence. Trouble is, it’s now okay to be an atheist saying religion is at fault for all of this – when what they really could be saying is that Muslims are at fault for all of this. But it’s not okay for atheists to argue this, simply because they’re casting a wider net (or for any other reason). It’s just as irresponsible as saying Muslims are to blame, and for the simple reason that it’s not only untrue – it’s slanderous to say. The truth is that, overwhelmingly, most of the world’s monotheists are either Christian or Muslim. And neither the prophet Muhammad nor Christ would ever – in a zillion years – endorse the typical activities of a terrorist group. So to blame religion as a motive, when – at best – it’s the appeal used by a numerically tiny group of zealots to recruit the inexperienced or the ignorant is not grounds to attack the faithful for their beliefs. And speaking of ignorance, let’s have another look at (and I cringe as I write this) "creationism". For those who’ve had their head buried in more intelligent literature, like Mad Magazine, and been caught unaware of the subject – creationism is the term ascribed to the beliefs of a tiny minority of Christians, generally native to the U.S. south-eastern "bible-belt", that believe in the literal word of Biblical scripture. Controversy about this group first hit the media a few years back when one group tried to establish the right to teach children basic falsehoods about the nature of the world using "freedom of religion" as an argument. (They lost, incidentally – because their arguments lasted about as long in court as it took to read about it here.) Most of us believers have dismissed this group as a largely confused morass of pretentious, socio-politically stimulated cultists whose theology, at best, misses the whole point of Biblical teaching by trying to achieve "righteousness" through sacrificing reason in hopes of realizing a greater faith. Again, contemporary atheists try to confuse the argument about God’s alleged non-existence likening the beliefs of these folks with the rest of "the faithful’. And, again, the issue isn’t faith itself here any more than it was in the study of Santa Claus as religion. Unlike the Santa Claus discourse, however, it is about the role one’s faith plays in decision-making, and serves as a useful demonstration of where faith can be misapplied. Some atheists will readily jump on this apparent concession that faith can be misapplied as sufficient evidence to warrant the dismantling of churches and mosques everywhere – citing if danger exists for even a few to be mislead by the drug "faith", it oughtta be exorcised from serious human consideration and never talked about again. But that same argument could be applied to all kinds of subjects, including drugs, and meet with about the same degree of success as "the war on drugs". Part of studying the subject of faith involves experiencing it, and then disclosing observations about that experience, as one would in any critical endeavour. And when one empirically measures faith the only way one can, by experiencing it, one will typically find that it has value if not revelations of its own about the truth of God’s existence, as many have reported. "Religion breeds belief systems that tend to be resistant to truth, and favour arbitrary statements about the nature of the universe above truths derived from empirical evidence. Consequently, inevitably, policy decisions affecting millions result that cause harm and slow progress that could improve quality of life. This is the case where stem-cell research is concerned." Above, I’m paraphrasing the arguments I’ve heard from contemporary atheism on a recent, relevant subject which makes the same, tired old mistake made by both detractors of religion and, ironically, the "hyperfaithful" over the centuries: pitting faith in God against science. In this the hyperfaithful – those who believe in things like the literal word of the Bible and see faith as somehow threatened by what senses and instruments can reveal – who have the weakest side of the argument, since reason is unavailable to them and as all arguments tend to end in "the Bible says that…" But the godless have fallen into an argumentative trap of their own making by raising this as an issue at all, because suggesting as they are that faith and science are exclusive, they become guilty of an arbitrary assertion of their own; of denying that one can believe in anything without the possibility one could reconcile those beliefs if they held that they are subject to empirical data. In other words, what if – as most believers do – one simply held a "theory" of God’s existence, and like most inventors and scientists sought to prove that theory using the tools and experiences available to them, over the course of their lives. A theory of God’s non-existence would be okay too, although that could qualify one also as an agnostic. Because contemporary atheism expresses a "belief" itself: that God does not exist. Without the empirical evidence they claim to be so fond of – without the empirical disproof of His existence. Another word for that is, of course, hypocrisy. By contrast, in its nominal form, atheism doesn’t necessarily hold that faith itself is wrong. Rationally, it can’t, because faith or at least "belief" is a necessary ingredient. And if that’s true, then is it wrong to hold back stem cell research on the possibility that God exists and doesn’t want us to pursue it? Of course it is! Because the rational person never lets faith trump science. If the two appear in conflict, then our beliefs and faith should adjust accordingly. And because for God to exist (for those of us who claim both reason and the capacity to believe in Him), there can’t be a conflict between our faith and what we see in the universe that was created by Him. It is because I respect my own beliefs and the inherent good in others having the right to select their own beliefs that I have pledged and shall continue to defend the rights of others to believe as they choose. In fact, this is a principle I could well find myself giving my life for were there a need to – I believe it that much. As a God-"fearing" Christian, I believe that’s my charge, true enough. But way beyond even that, my faith in acting to promote happiness as an ultimate goal is sufficient to motivate me to this extent. So I can fully and readily understand that atheism is a fully ethically-defensible belief system. To some of my fellow believers, this might amount to heresy – but they’re obviously mistaken and misguided. I would readily compound that heresy by even finding myself defending any atheist from the kind of persecution I’ve often heard reported, though have never myself been a witness to. And without detracting in any way from the severity of any individual cases of persecution, it should be pointed out it’s really not so widespread that atheists should find themselves trying to claim ‘underdog’ status. Worldwide, it’s almost certain that it’s persecution of Christians that is far more frequent. But even were I not a supposed heretic, I’d have to expect Christ himself to defend atheists were he around to do it. Even leaving the notion of ‘love thy neighbor’ aside, Christ’s own sermons were clear that his followers were only to "preach the Gospel to every creature" – not harass them if they didn’t subscribe to it. And, of course, anyone acting either as a terrorist or conducting violence in God’s name, is most definitely not doing so. So why is it contemporary atheism continues to see religion as the cause of the world’s evils? Indeed, what’s preceded has been an indictment of contemporary atheism in that the assertions it makes about faith and religion are essentially dishonest and misleading. This review doesn’t represent much depth in terms of philosophy or theology, and yet it certainly seems sufficient pause to exonerate religion from virtually all of the charges against it, as put to us by the latest authors on the subject. But perhaps the biggest complaint one could have about Dawkins and others that form this group is the continuing citations of groups, supposedly representing all faithful, that actually represent the tiniest minority. It’s a form of academic cowardice that might make great pulp fiction for some, but isn’t actually profound the way Marx’s revelations about religion being an "opiate of the masses" or Nietzsche’s statement that "God is dead" were. Marx was attacking the subject from the angle of the origin of religion and Nietzsche was contributing new philosophical ideas on the subject "perspectivism" and moral truth (and logic). Indeed, Nietzsche would have found Dawkins something of a dilettante, I’d expect. The read may be harder, and challenging. But if people want to really learn about atheism there are far more worthy reads on the subject than a dismissal of God on the mere basis of analogy and citations of religion by verbal crucifixion of its fringe elements. A good starting point would be to read Nietzsche’s Beyond Good and Evil, wherein religion is attacked, somewhat successfully to that point in time, on a theologian-by-theologian basis, creating a multitude of rationally-evoked critiques grounded firmly in reason, which is the real province of all science and academic pursuit. Finally, I’ve mentioned the botanist Richard Dawkins somewhat here and there, but this wasn’t intended as a direct attack on him, rather than on his popularity and the popularity of his ideas. I’ve read two of his essays (one found here) and his latest work on religion, The God Delusion and find nothing (and I mean nothing) philosophically noteworthy in anything written. Easily, each statement is refuted through the lens of analogy and invective on the marginal elements of religion than its core purpose and ideas. What’s needed here is for someone to pull the debate to a higher level. Dawkins might be writing to sell books and clearly has done that. But what would out-do Dawkins is an atheist who can be both provocative and who can poll the arguments against religion the way Nietzsche did in his critiques of earlier theologians. And I’m still waiting for that to occur.